Waking up to the sound of birds singing felt surreal. It took a few minutes to realize we were actually in Kenya. Yesterday our 5 Canadian Team members (Brittany, Kathy, Tracy, George and Cheri) all arrived safely with 11 bags of supplies, wheelchairs, walkers and crutches. It was a long trip and had its challenges getting through Kenyan Customs, but well worth it when we wheeled those filled carts down the ramp towards the parking lot to start our new adventure. At breakfast we were welcomed by Benard who looks after all of Mikinduri Children of Hope’s projects in Kenya. Benard has a smile that is contagious and a hug that is so heart felt and sincere, you cannot get enough of them. We were joined by a couple of the Kenyan Board members, and had a lovely time chatting like we were old friends. After breakfast, Paul our driver picked us up and we headed out to our next destination. Paul has been a friend and supporter to Mikinduri Children of Hope for 10 years. Throughout the drive Paul asked about previous team members he has met over the years. 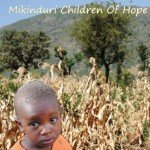 As he reminisces, I think about how much Mikinduri Children of Hope has done, the lives that have been changed, and the many people that have played a part each step of the way. To all of our donors and dedicated volunteers, it is a pleasure and a privilege to be part of the team that represents you in Kenya this year. Looking out the combi (van) windows we watch the hustle and bustle of busy Nairobi life. People and cars moving everywhere with random donkey drawn carts in between it all. As we pass through small towns we see herds of livestock being shepherded by all ages, including young children. As we drive along part of the Rift Valley we admired the stunning scenery, while trying to not actually look straight down. Still in a bit of a jetlagged daze, someone yells, Giraffes! 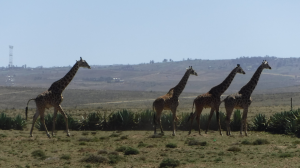 We look out, and there on the side of the road are four Giraffes hanging out and grabbing a quick snack. We stop for a photo op, still not believing what we are seeing. When we take a second to look away from the Giraffes we notice herds of Zebras in the distance. Yes, it is all real and we are definitely in Kenya.